Shade Size: Required 8" 12"
Our Dahlia Industrial Floor Lamp Accents Your Décor with Nautical Inspirations! Our Dahlia Floor Lamp features an elegantly crafted wave design that provides a hint of the sea to your décor! Perfect as a reading lamp for your living room lighting or as a task lamp for your next project, the flowing design of the Dahlia makes any house a beach house with its nautical inspirations! Available in black, cherry red, galvanized silver, mahogany bronze, yellow, and solid copper, the Dahlia shade is the perfect accent to your décor no matter your style. The shade in a 12” size, and pairs well with all base finishes. Whether it’s lighting for your rec room or your home office, the Dahlia provides a warm swath of light for reading and accent lighting. 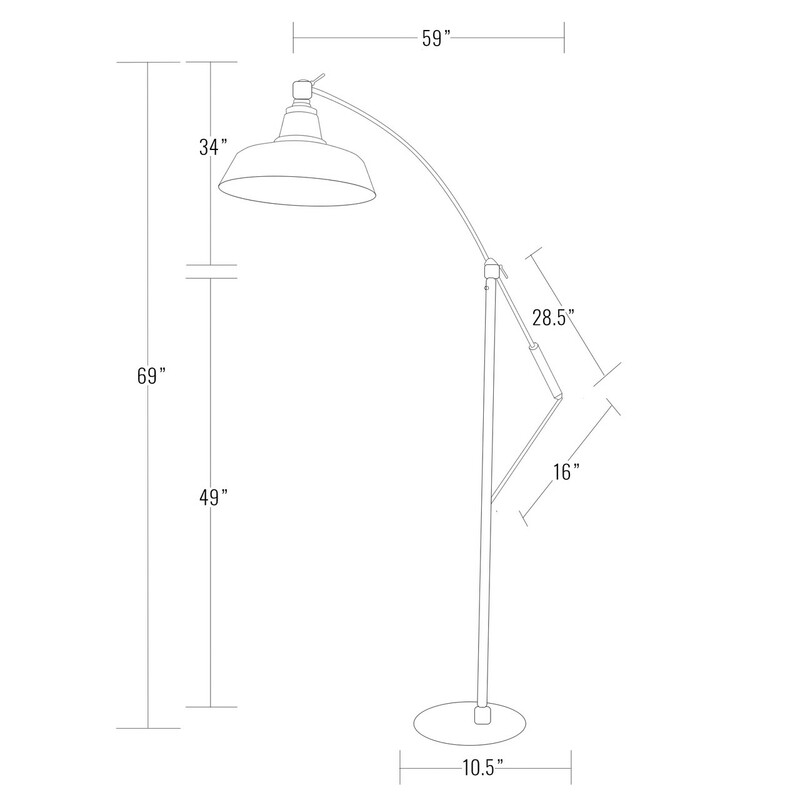 Our Dahlia Floor Lamp is fully adjustable to find that best angle of lighting for your leisure. The height of the lamp and angle of the shade are easily adjusted via conveniently placed knobs on the base, and the counterbalance weight on the next of the lamp keeps the fixture upright. An integrated dimmer dial also allows you to tailor your lighting to that perfect level. Pre-installed with our energy efficient LEDs, our Dahlia Floor Lamp produces a warm yellow illumination that reduces eyestrain and encourages longer reading times! Cocoweb LEDs are brighter than a 100W screw-in bulb and use 75% less electricity for the most eco-friendly lighting on the market! Best of all, our natural light LEDs last for over 50,000 hours and are fully dimmable! Our Dahlia series of Dahlia Lights comes in a variety of different wall and floor installations to match perfectly with every area of your home! Complete your design with our Dahlia Gooseneck Lamps, Pendant Lights, Wall Sconces, Sign Lights, and Floor Lamps! Our Dahlia series of Barn Lights comes in a variety of different wall and floor installations to match perfectly with every area of your home! Complete your design with our Dahlia Gooseneck Lamps, Pendant Lights, Wall Sconces, Sign Lights, and Lamp Posts! I selected the exact floor lamp I wanted within minutes! I can't wait to see it in person!